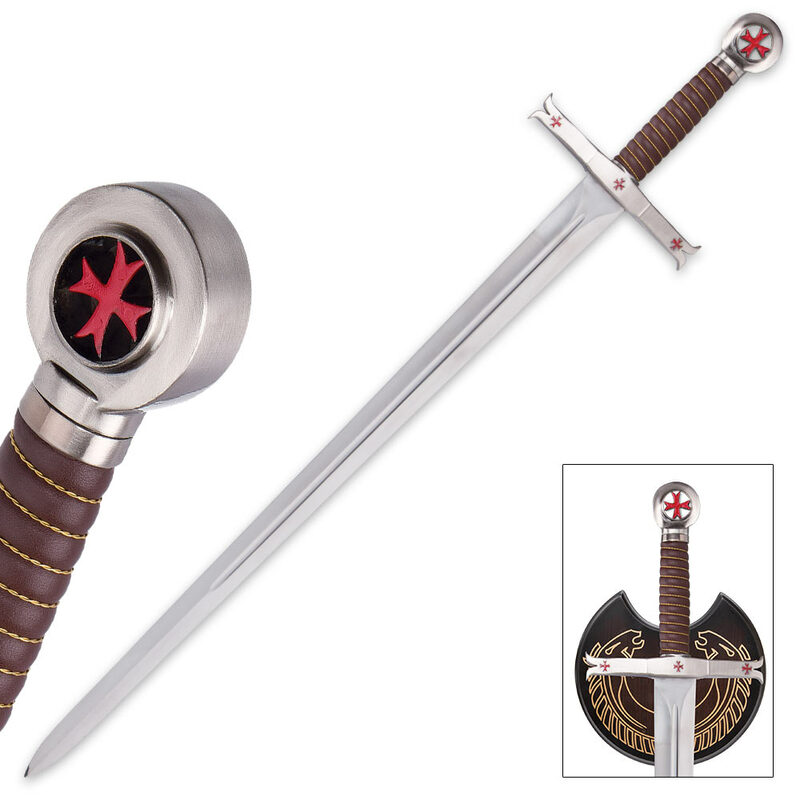 Crusader Knights Templar Sword With Wooden Display Plaque | BUDK.com - Knives & Swords At The Lowest Prices! Imagine yourself in the legendary order of the Knights Templar. Fighting in the Crusades, you’re a chivalrous-yet-deadly knight atop a stately white steed, riding swiftly into battle. As you pervade the hordes of Ottoman warriors, you draw a shimmering double-edged longsword. Grasping the leather handle, you pivot your powerful arms left-to-right, up-and-down and slay Ottoman warriors in scores as you struggle bravely to return control of the Holy Land to the church in Rome. When you wield or gaze upon the Crusader Knights Templar Sword, it’s not so hard to picture yourself in such a scenario. 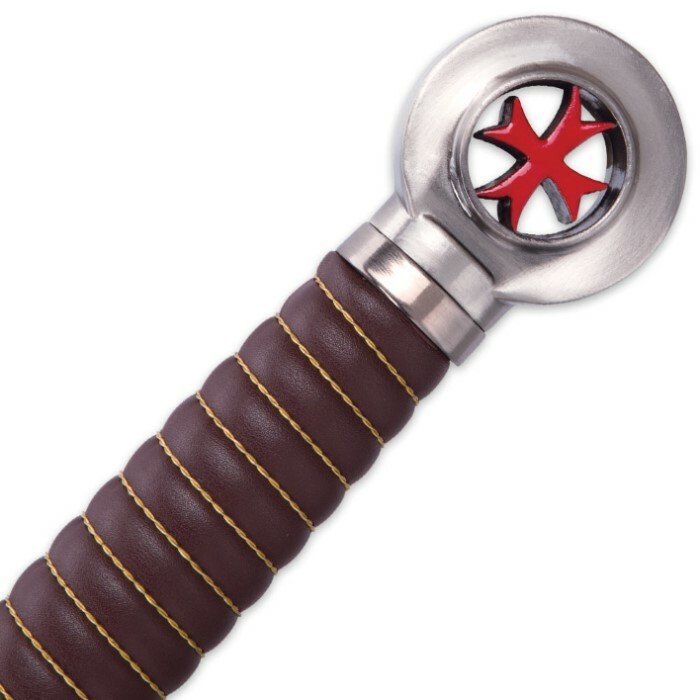 Paying homage to the storied order, the gleaming zinc alloy guard and pommel are accented with red Knights Templar crosses, offset by the handsome brown of the stitched leather grip. The impressive 30 1/2" false-edged stainless steel blade glints and dazzles in the light with its brilliant mirror-polished finish. Truly stunning in both design and craftsmanship, the Crusader Knights Templar Sword displays beautifully, especially when hung on the accompanying wooden plaque. The stately plaque features an exquisite double horsehead design printed in gold - a lovely contrast to the plaque’s deep brown burst finish. The elegant set will without-a-doubt draw gazes and admiration wherever you decide to display it - home, office, man cave, workshop, cabin, classroom, or anywhere else that could use a touch of historic class. 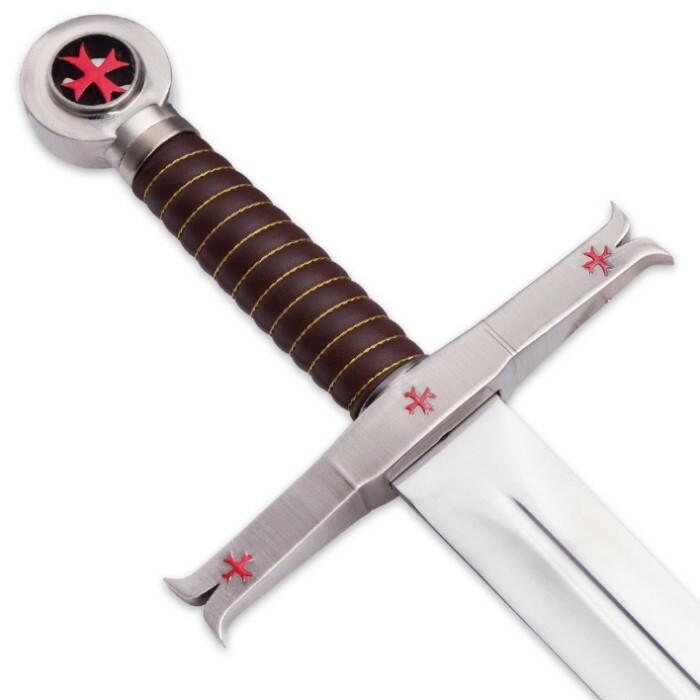 Also great as an authentic-looking prop for reenactments, theater, screenplays or for cosplay and makes a terrific gift for sword/knife collectors, medieval history buffs, Middle Ages reenactors, Knights Templar scholars/hobbyists, cosplay devotees, or anyone who appreciates great artistry and craftsmanship. At this low price, getting two - one for yourself and one to gift - won’t cleave and slash away at your wallet, either! Measures 39” overall.